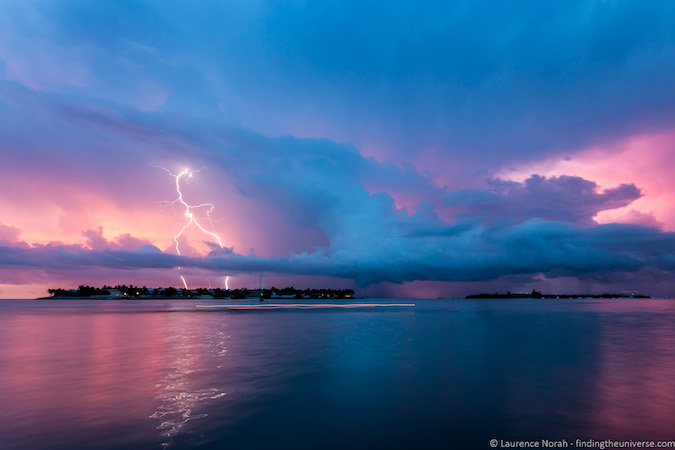 Today, professional photographer Laurence Norah of Finding the Universe, finishes his five-part series on taking better travel photos. In part five, Laurence is giving some simple post-processing techniques that you can use to make your travel photos wow your friends and family! Editing your photos is just as important as how you compose them, so I hope you’re ready to take some notes! One of the most misunderstood parts of digital photography is what happens after you take the shot: editing your photos, aka post-processing. This is where you edit the images you have taken, to create the final product. Post-processing is the equivalent of the darkroom from the days we shot in film. In today’s post, we’re going to be covering some ideas for editing your photos, from the basics (cropping and leveling), through to more complicated actions like recovering shadow and highlight information. 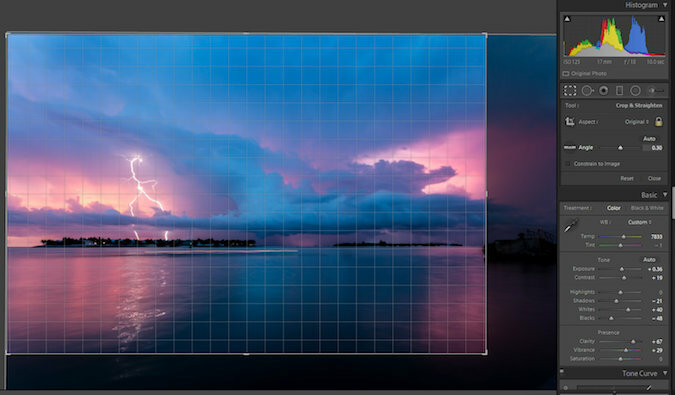 The crop tool allows you to change the size of your image, and also to change the aspect ratio. For example, you can crop an image from a rectangular shape to a square shape. There are many reasons you would want to crop, including for publishing in different formats and aspect ratios. Compared to the original, I have cropped the image to remove the dark part of the pier on the right-hand side of the image and recomposed using the rule of thirds, so I have one-third land and two-thirds sky. This makes the lightning bolt more the focus of the shot. You might wonder why I didn’t just compose properly when taking the shot. Well, in this case, I was doing a long-exposure shot without a tripod, so had the camera balanced on the edge of the pier for stability. That very much limited my ability to perfectly frame the moment, so I just shot wider, knowing I’d be able to crop the shot appropriately after the fact. Let’s look at what cropping looks inside a couple of the tools available. 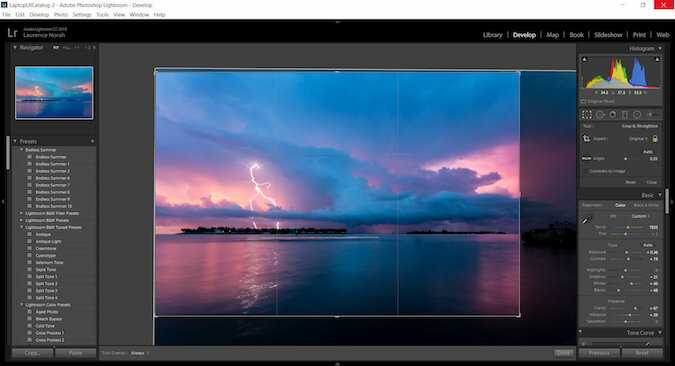 In both cases, cropping is very simple: it just involves you selecting the crop tool and then selecting the area you want to keep with your mouse or finger. Then you apply the changes, and voilà, your new cropped image is ready to go. As you see from this and later examples, the tools look similar across different platforms, so it’s easy to apply the learning you have from one tool to another. One of my personal petty annoyances in photography is when the horizon line in a photo isn’t level. Sometimes when we’re caught up in the moment, this basic compositional rule is forgotten — but the good news is that editing your photos to make them level is also very easy. 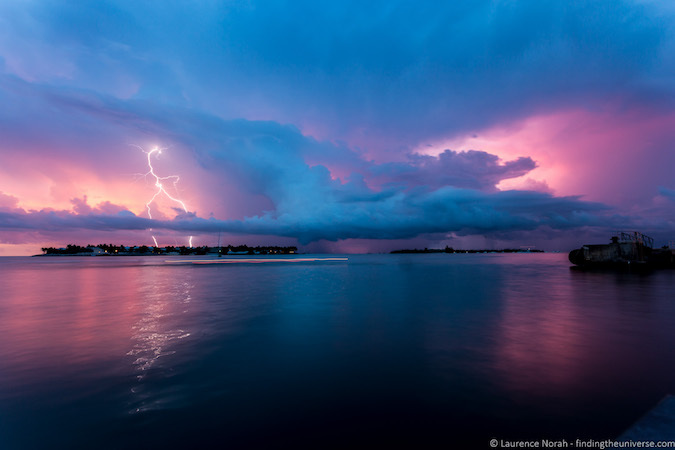 I’ll use the lightning shot as my example again. Balancing the camera on the edge of the pier meant that the shot wasn’t level — this is particularly noticeable to the eye when the image has a clearly defined horizon line, such as the sea. 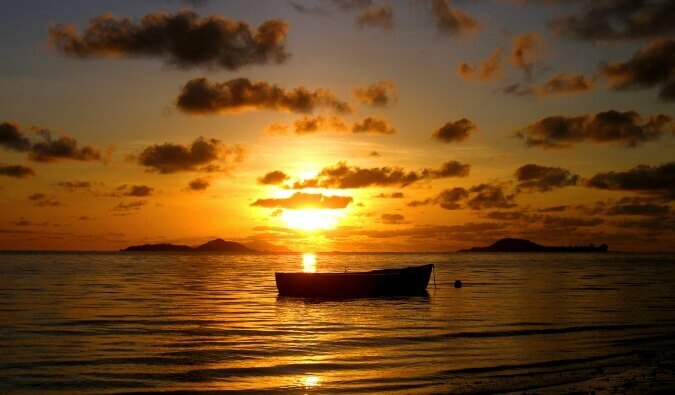 If we look at a zoomed in version of the image in its original form, with a line overlaid near the horizon, we can see that it’s not level — the line is closer to the horizon on the right-hand side than the left. In Lightroom, the level tool is part of the crop tool, and you can just rotate the image to suit. When you use the level tool, a grid will appear to help you get the alignment correct. 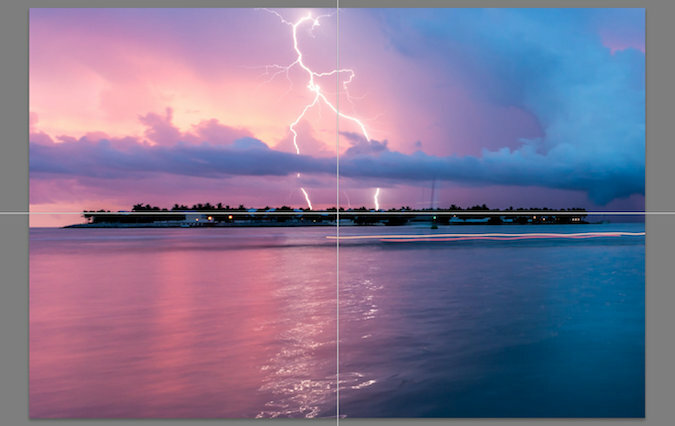 Here’s a screenshot of that in action in Lightroom. Leveling an image is a really simple task that will take just a few seconds of your time, resulting in a much more visually pleasing image. Vignetting is about making parts of the image darker or lighter than other parts, in order to make it clearer what the subject of the shot is. 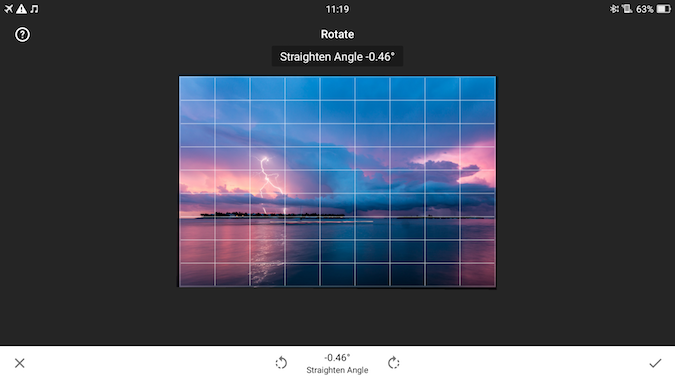 Some tools restrict your vignette to the corners, but in applications like Snapseed and Lightroom you can selectively darken and lighten areas of the image — you don’t need to restrict yourself to the corners. Taking the lightning shot above, let’s load up the vignette tool in Snapseed. Here we have options for how big to make the “center size,” i.e., the area to be edited. Inside this area, everything can be made brighter (inner brightness) and everything outside the area can be made darker (outer brightness). We can also do it in reverse, making the inner darker and the outer brighter. 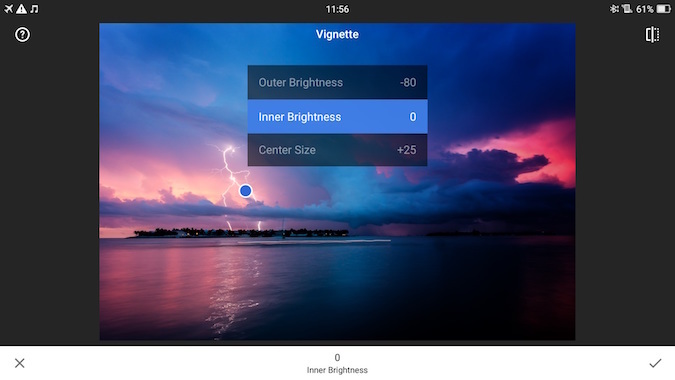 Above are the settings I chose for outer brightness and inner brightness, while below is the size of the vignette itself, which is based on the center size setting. Vignetting is particularly good for portraits, and anywhere where you really want to make the subject of the image more clearly obvious to the viewer. Sometimes when we take a photograph, parts of the shot might end up being darker or brighter than we want. We refer to the dark areas of the shot as shadows, and the bright areas of the shot as highlights. We can fix this by changing the brightness of the shadow and highlight areas specifically, using either the “Shadow” or “Highlight” tool. This is a tool that works particularly well on RAW files as they retain more information on the shadow and highlight areas of an image compared to a compressed JPG, which discards most of this information in order to save file size. Let’s take a quick look at adjusting shadows and highlights using Lightroom. 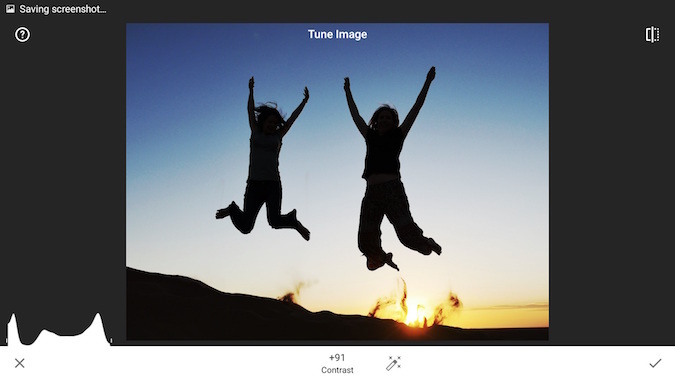 In Snapseed, shadow and highlight adjustment can be found under the “Tune Image” setting. As you can see, the fireworks and bonfire are clearly visible, as are the torches the couple is holding, but the rest of the shot is dark. Let’s adjust the settings and see what we can get. In this version of the image, the couple is much more visible, as is the hill the fireworks are on and the surrounding crowd. To achieve this I increased the overall exposure of the image, making the whole image brighter, including the shadows and the highlights. Then, as the shadow areas were still a little dark, I increased those a little more. Finally, as the global exposure adjustment made the fireworks and bonfire too bright, I reduced the highlights a little bit to give the final result. Shadow and highlight adjustment is useful in a wide range of scenarios to help balance the image out — bringing overexposed areas down in brightness, and helping to boost the shadows. Just be aware that a light touch is recommended — increasing the brightness of the shadows too much can result in a lot of noise being revealed, which might look unnaturally green or purple. Contrast is about accentuating the difference between the light and dark parts of the image. Increasing the contrast of an image can dramatically improve the visual impact that has, by making the boundaries between those light and dark parts clearer. 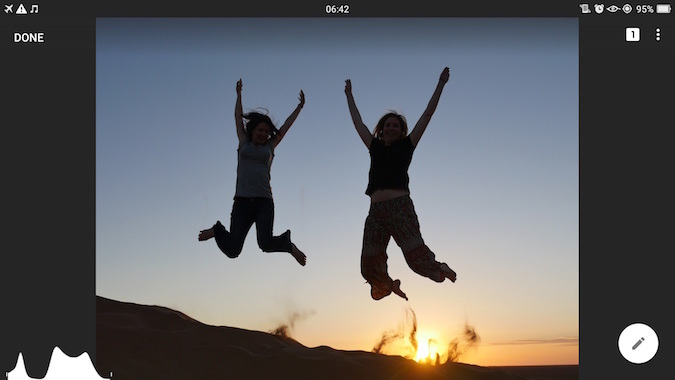 Let’s take a look at a shot of people jumping against the sunset in the Sahara, for example, which I’ll be editing in Snapseed. There is nothing too wrong with this shot, but it lacks the visual impact that I wanted. 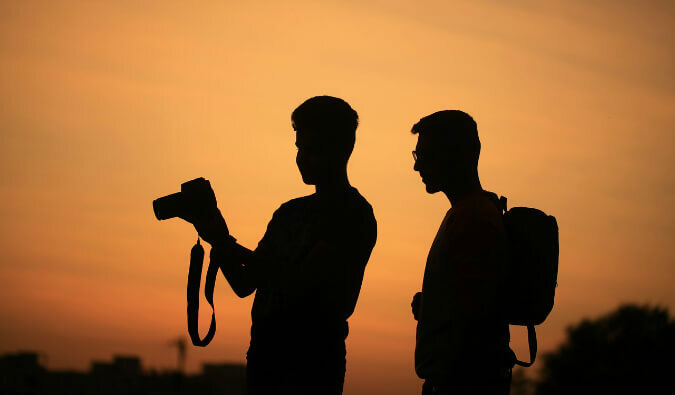 Ideally, I would want the shapes of the people to be in full silhouette against the sun, but as it was shot the camera picked up some skin tones and clothing color. Using the contrast tool, we can make the dark areas stand out against the bright areas. As you can see, this made the jumping figures and the dune more silhouetted against the sky. In most shots, you only want to tweak the contrast a little bit to get the desired effect, normally no more than +20 or so, but in this case, the higher number gave the best result. Color adjustment is another important piece of the editing toolkit. 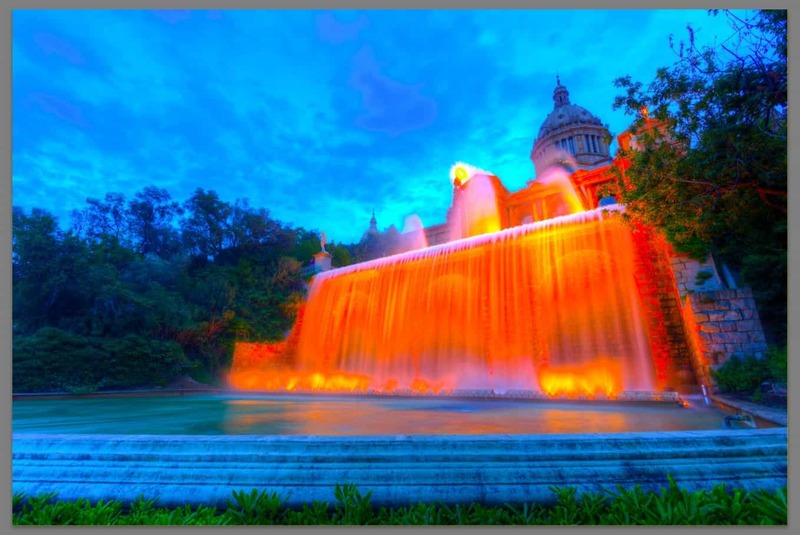 We can adjust image color in all sorts of ways, from changing the overall “warmth” of the image (how blue or yellow it appears), to individually changing the hue and saturation of specific colors inside of an image. For this post, though, I just want to cover some very simple color changes you can use to make your images just a little more visually impactful. As with many edits, the key is to find a good balance — oversaturated images tend to look rather unnatural. Desaturated images can be very effective, and of course black-and-white is an excellent choice for all sorts of situations, in particular, portraits, architecture, and certain landscape scenes. But generally you would want to find a happy midpoint: not too oversaturated and not too undersaturated. Saturation is adjusted on a sliding scale and is on the basic adjustments panel in Lightroom or the “Tune Image” option in Snapseed. The last area I’m going to touch on today is blemish correction, or “image healing.” Sometimes there will be something in an image that you really don’t want to be there, like an inconvenient pimple on someone’s face. This is easy to remove in all the major editing tools. You can, in theory, remove any object from a scene, but the healing tool works best on distinct, small objects that are surrounded by uniform colors. This is because the heal tool has to replace the area you wish to remove with something else, and this works best when it has an area nearby that looks similar. So for example, a pimple on a face is surrounded by a lot of similarly colored skin, so the heal tool can easily calculate what to replace the pimple based on the surrounding area. Let’s say for some reason I only wanted to have people sitting in my shot, and I need to remove the standing person. She is a good candidate for removal as she is separate from the rest, and the surrounding scenery is not too complicated. 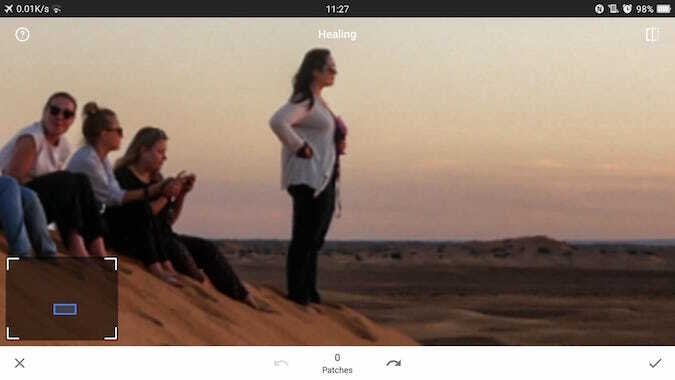 In Snapseed, we load up the healing tool, then we zoom in on the object to be removed with the standard “pinch to zoom” gesture. Next, we use our finger to draw the area to be removed. It’s important to be as precise as possible because the tool is most accurate with small objects. 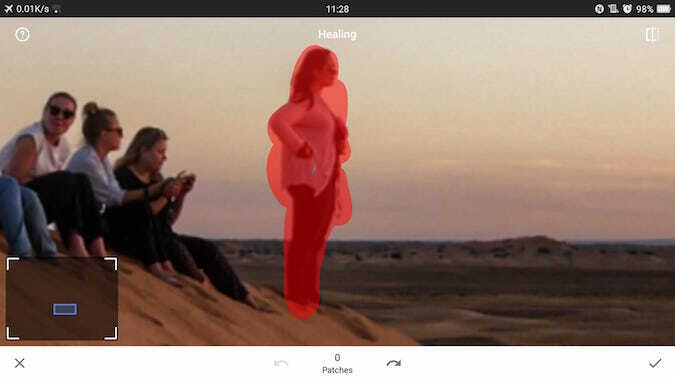 Once we have drawn the area, Snapseed will edit it out, replacing it with the best guess of what is behind the object. As you can see, the result is impressive, with no real evidence that there was anyone standing there at all. 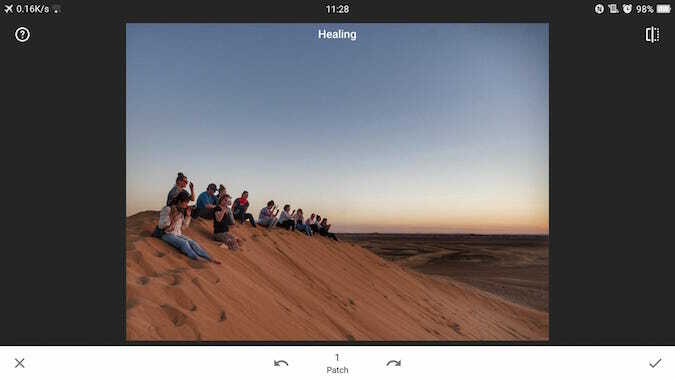 The healing tool is perfect for all manner of fixes, from editing out unwanted background strangers in your shot, to removing skin blemishes in portraits or power lines in landscape shots. Adobe Lightroom (PC or Mac) – Lightroom is the industry standard tool for photography professionals. But this post is not going to focus on Lightroom, nor cover everything you can do in Lightroom, as it’s a massively complex tool, covering both photo management and photo editing. 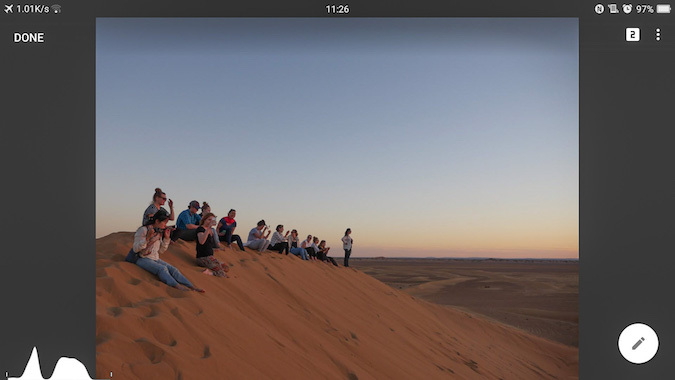 iPhoto (Mac) – I list iPhoto here mainly because it’s a commonly used tool among Apple users. However, I personally never recommend using it. While it will let you do everything that I cover in this post and is better than nothing, the way it manages your photos makes it hard to migrate to a more sophisticated system further down the line if you choose to do so. Picasa (PC or Mac) – Picasa is a free desktop photo editing application from Google. It’s very simple, but it allows you to do everything I’m going to cover in today’s post. If Lightroom is a bit overwhelming, Picasa is a great, free place to start. 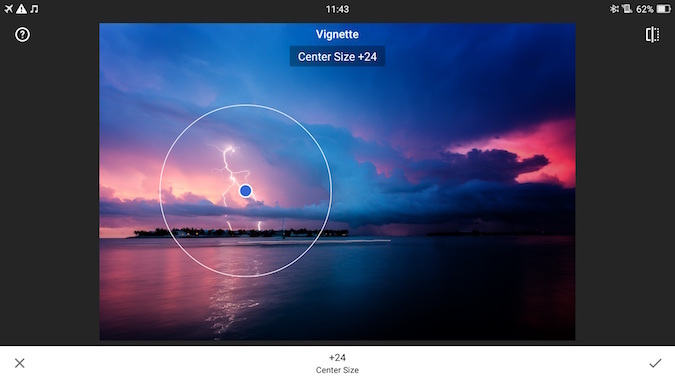 Snapseed (iOS or Android) – Another free Google tool, Snapseed is the best mobile image-editing app for both iOS and Android. It’s an incredibly powerful tool that, while simple to start using, has a great many features that take time to fully master. I use it for 95% of my mobile editing needs. Let’s take a look now at what you can and should be using these tools for with your images. Editing your photos is a crucial step that far too many people skip. 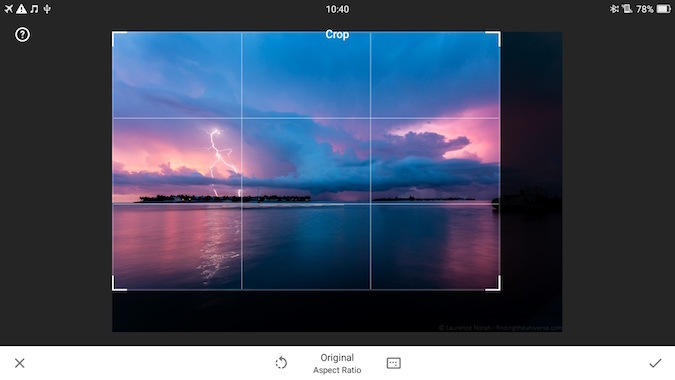 As you can see from this lesson, there is much more to editing your photos than just picking a filter and posting your picture on Instagram. By incorporating some of these tips and techniques into your post-processing routine you’ll be able to improve your travel photography in leaps and bounds. So get out there and start taking pictures! Thanks for the tips. That might have to be my new year resolution to play around with my photos! Fantastic tips! I like the way you have kept it like really basic and still gave away some easy ways to enhance a picture. Also, i swear by Snapseed, it is one hell of an app. especially for people like me, who are into mobile photography! Thanks for sharing his tips, I now have a place to start! This is a dead useful tutorial – thank you for sharing your expertise on photo editing… ^_^ The landscape shot is beautiful as it is. . . Thanks for the great tips! I’ve been using Photoshop for years as a Web designer, but found that I was not getting the results I wanted when it came to post-processing. I moved to Lightroom just a month or two ago and haven’t looked back. I keep finding new features and new ways to tweak my photos, and they keep looking more and more professional as a result. And I will definitely be checking out Snapseed. Really helpful… thank you! What an odd comment. I have used different versions of PhotoShop for close to 2 decades. It absolutely is focused (heh) on the needs of photographers . . . although the program does have significant downsides (learning curve, very expensive, etc). It is the industry standard–by far!! 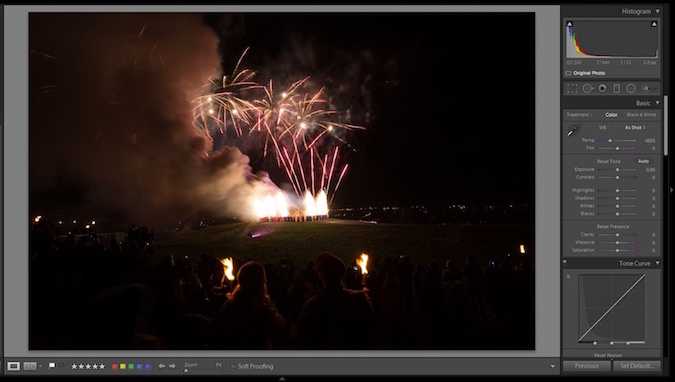 !–although for beginning photographers/retouchers, Lightroom will probably be more than enough for your post-processing needs. After a trip, I had to spend a lot of time on Photoshop to illustrate my photos. Nice tips Laurence 🙂 Have you tried Lightroom on mobile? It\’s free now, at least for iOS and does pack a punch! It’s pretty cool 🙂 My pleasure, pleased you found them useful! I’m starting to focus more on more on taking and editing pictures – it’s not something I’m best at. Thanks for the tips and for recommending the editing tools. Gonna try and download Picasa – don’t know why I haven’t done that ages ago! Hi Matt. thanks for the great suggestions and info. I have a lot of issues with silhouettes. I have tried quite a few and they never come out quite right. I will have to keep trying and maybe check out Snapseed. Thanks again. Enjoy your blog! Thank you – this is great, and helpful. I have been working to improve the image quality on my own blog. Hi Matt, Thanks for all the tips. 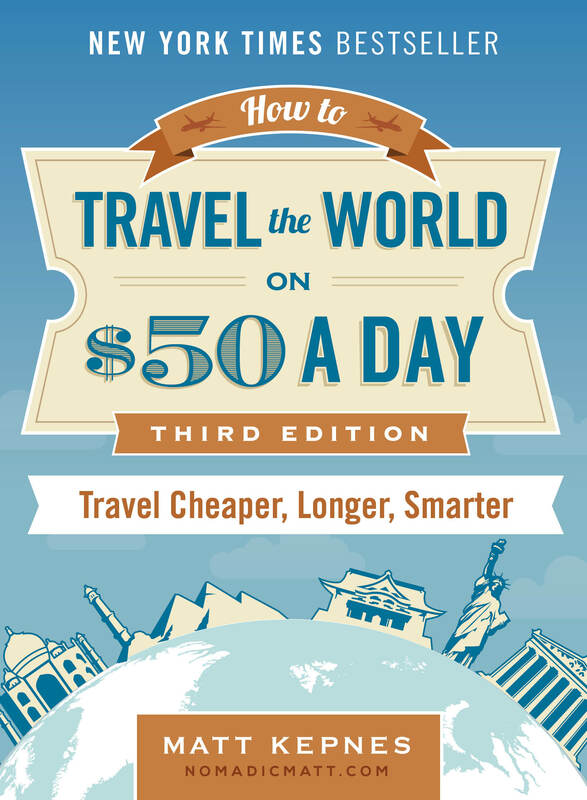 I’m new to blogging, and I would say an intermediate traveler. Usually I would take photos on my iPhone because it was just for my own memories. Now I would like to share them with the world. Would you say its the processing that gets you better photos or does the camera outweigh that? Your tips are quite useful to me. I rarely edit photos for the simple reason that I lack the skills. Also editing takes a lot of time. I do have some experience playing with Picasa, but other tools are new to me. Planning to check them out sometime soon. You’ve done your job elegantly. This kind of editing skill is really amazing. I am not much skilled at image editing but i love your works. Good and a practical post, Laurence. 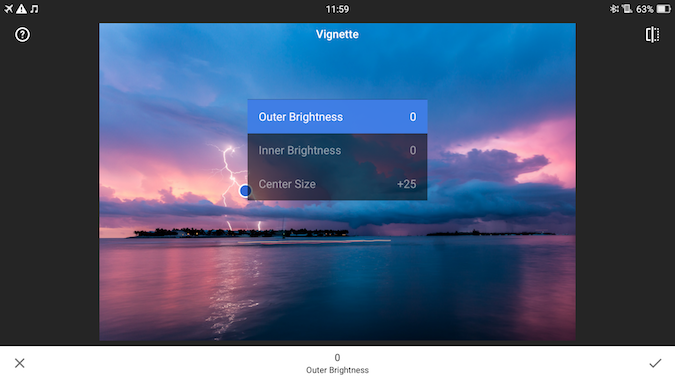 I now understood how to properly use the “vignette” feature! I’m hooked to your photography related posts. Could you also write about your photography workflow? Wondering how you are managing tonnes of RAW files, processed images, storage, etc. 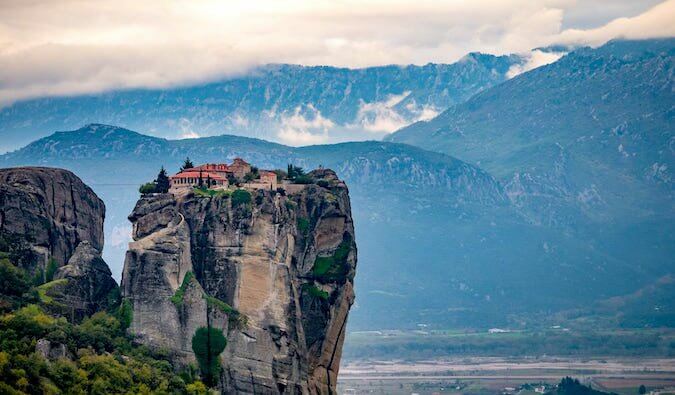 Nothing can be a better choice than Photoshop in editing photos. But its true that, those who are not expert in Photoshop for them all available online editors can help. I have used SnapSeed and its pretty good editor for the usual editing task. My son and daughter are always encouraging me to give editing a whirl. I’ve resisted because it seems like a daunting task. Thanks for making it seem a bit more accessible, I promise to give it a try! These are great tips! In my humble opinion, the most important tip here is to shoot in RAW. When it comes to colors and lighting, you can pull almost anything off quickly in post-production if the color data is there. RAW gives you that extra boost in color data that you might need when you get back to your desk and are working in your photo editor of choice. Awesome tips! Everything is written in detail and understandable. Thank you, I will use. I swear by Stellar Phoenix JPEG Repair! The software fix blurred, grainy or any unwanted line from an image and restores its originality without any compromise in the quality. These all tips are fabulous. I will definitely apply this when I capture photos. I liked the “tip #4. Shadows and Highlights”. This is a very important factor when editing an image. Most of the time this is the huge problem as well when you don’t know how to balance it. I shared your post as well with my friends. Thank you so much for sharing huge things. I will surely visit in your blog again soon. I was actually searching tips for editing travel photos using mobile phone and got this one. All the tips you added are really helpful. Do you have any suggestion for mobile? I meant to say that any app? Hi, What a great tips! Absolutely fantastic. I appreciate your post. As a graphics designer, I personally like to use Adobe Lightroom. This app is designed for iPad and is only available for Apple products. It is a photo editor with capabilities for saving to Adobe Creative Cloud. 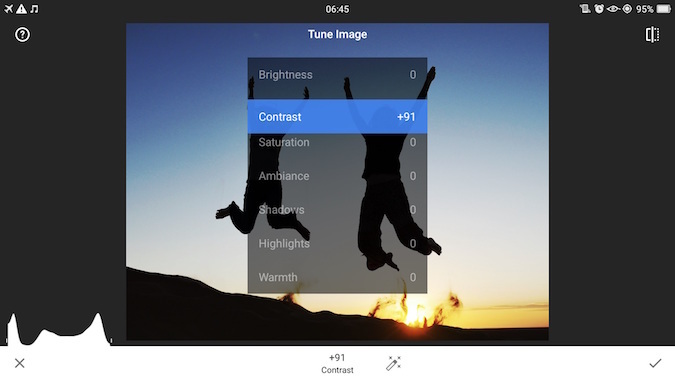 The only unique function of this app is the ability for advanced edits, including a tone curve for adjusting color, exposure, tone, and contrast. Amazing post, after reading this post it’s too easy for me. Thanks for sharing. Hope in your next post I found a lot of information. Thanks for your informative article. Unfortunately, Picasso is no longer available. The replaced it with Google-something which didn’t impress me. I tried to get Snapseed for my PC but had to download Bluestacks first because it’s an Android emulator (I think that’s the right term.) I’m not too happy with that because Bluestacks is a large program and takes a long time to load. Then Snapseed seems slow, too and not easy to save photos from. I wish Picasso would be brought back!